News New ERN Information Video and Flyer for patients and healthcare professionals! 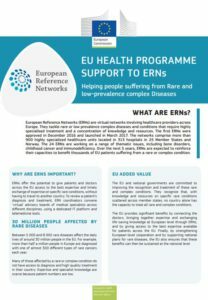 The European Commission has just released a new flyer and video about the European Reference Networks aimed at informing patients and healthcare professionals about how the ERNs work. 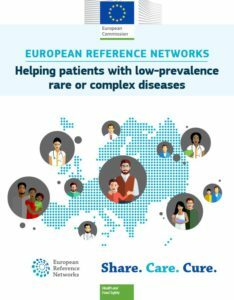 It introduces how the 24 ERNs convene virtual panels of experts in rare diseases in order to discuss complex clinical cases. This video will help all patients and doctors understand how they can gain access the expertise of the healthcare professionals of the ERNs as well as learn about the other activities of the networks (e.g. production of guidelines and expert consensus statements, patient pathways, clinical outcome measures, as well as research activities, training and education, building of FAIR registries, and eHealth tools). These new informative materials are currently available in English but will be translated in all the EU languages in the New Year!